It’s hard to believe five years have passed since Mother died on November 30, 2004. Shortly thereafter, an Omaha newspaper columnist paid tribute to noted Omahans who died that year. He quoted Garry Trudeau, who had recognized others. This little quote, whose pronouns I’ve changed, is taped to my desk lamp and lifts my spirits whenever I miss Mother. She still makes me smile. I’m proud of her life-long involvement in community efforts. Well known in Rolfe as “Marion the Librarian,” she spearheaded many library projects and fostered a love of reading. She organized fund-raisers, taught Bible school, was a Cub Scout den mother and 4-H leader, and late in life was a kindergarten volunteer. And throughout this time, she painted and, with our father, raised six children. Mother’s influence was long lasting and often quiet. She tutored a high school senior in a course needed for graduation. She provided financial assistance enabling another senior to attend college. She created the original database for Rolfe’s online cemetery records. Her teaching ceramics in Bible school later inspired a former student to take up pottery. Mother loved reading with her grandchildren and delighted in their accomplishments. In addition to her paintings and needlework, other tangible items are constant reminders of Mother’s presence. I wear her purple poncho. Only after Peggy e-mailed a photo of Mother knitting it, did I realize Mother knew how to knit. Mother’s colorful gifts to Hal decorate our home. Several angels in my collection were gifts from Mother or part of her collection. Each has a story. Mother gave me a jade ring that had been given to her grandmother sometime before 1900. I think of Mother when I wear it and enjoy telling its story when people ask about it. My home office is full of photos, including many of Mother. My favorite was taken in 1998 at Mother’s retirement party. This picture is on my desk and shows Mother, Peggy, Louise and me each reading a Mary Higgins Clark book and sitting on our cars with their license plates, LIBRARY (Mother’s) and READ (mine). 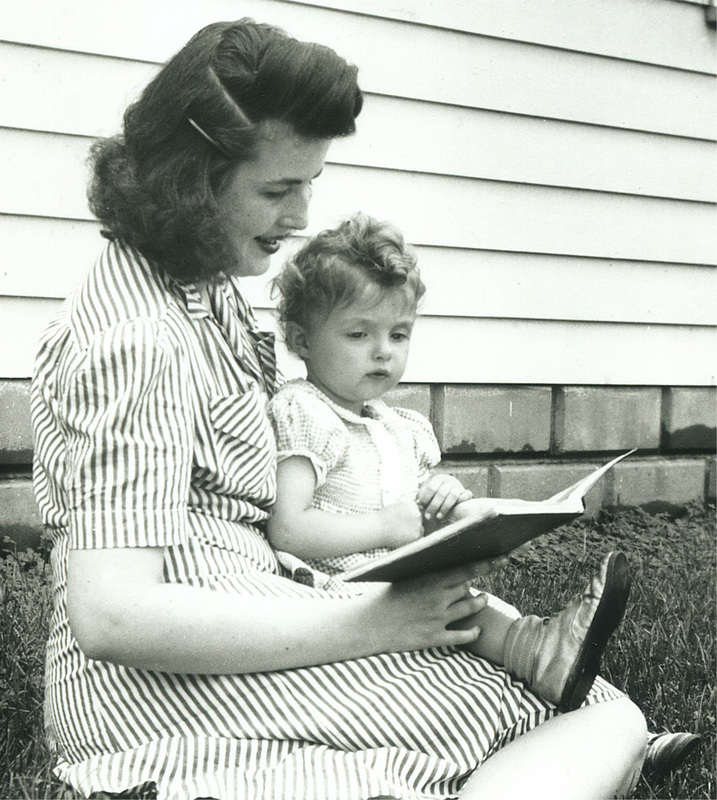 Another photo is of me, probably age two, sitting on Mother’s lap while we read a book together. Her own mother died when Mother was just 31. How boundlessly happy I am that Mother lived a long, meaningful and productive life; and that, adult-to-adult, we shared so many experiences and interests. This entry was posted on November 30, 2009 at 12:08 am and is filed under Marion Gunderson. You can follow any responses to this entry through the RSS 2.0 feed. You can skip to the end and leave a response. Pinging is currently not allowed. This is so beautifully written. I too have many reminders in my home of this wonderful woman who so enriched my life. I shed a tear this morning while at the same time feeling love swell in my heart for Mother. I, along with many others, am truly blessed to have had her in my life. I’m with you sisters. Very soon after Mother passed away, in honor of Mother I was given a pewter flat ornament that says, “Merry Christmas from Heaven. I love you all dearly, now don’t shed a tear; I’m spending my Christmas with Jesus this year.” I hang this on our bathroom mirror every year so that I see it at least twice each day — when I get up and when I go to bed. I’m sure for any person who has given up his/her mother, what this pewter piece says applies. It’s just that today, it applies especially for Mother. Even though the family wasn’t physically together on November 30th, I was with you all in spirit, thinking of Mother and how she broadened our lives and how truly lucky we were to have her in our lives.